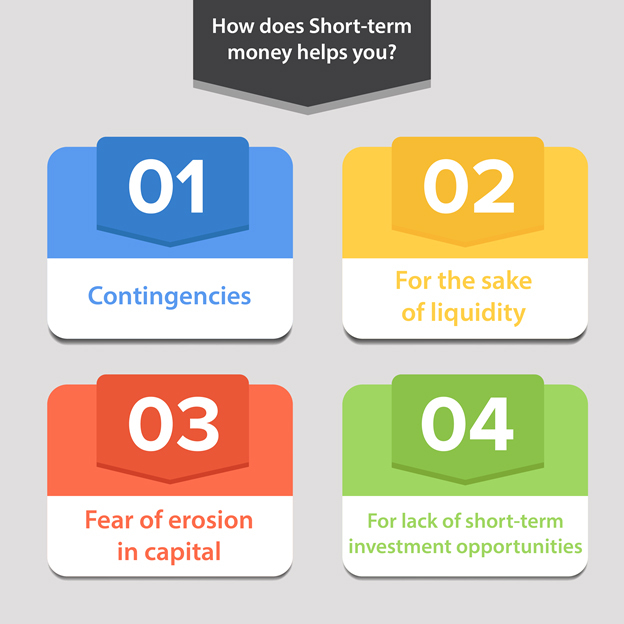 What is short-term money and how does it help you? Short-term money is the money which is left out after all expenditures have been met from the income. This unallocated money is what everyone keeps in the form of cash at home or in a savings bank account. Before we understand the investment avenues for short-term money, we need to understand inflation. At present, the inflation rate in India is around 6-7%. This means if the cost of 1 Orange today is Rs100/- and assuming that the supply and the demand remain unchanged, the same orange would cost Rs105/- next year on the same date. Therefore, money loses its purchasing power due to inflation. Hence, the short-term money invested should grow on par with inflation, or at a higher rate, and should be readily redeemable in case you need it for something. Short-term capital gains are taxable at slab rates.